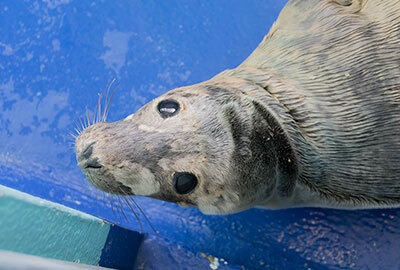 Charlie, 10 weeks old male seal pup, was rescued on 20th January 2018 from Church Cove, Gunwalloe by some members of the British Divers Marine Life Rescue (BDMLR) team. This pup was found with wounds to his body. 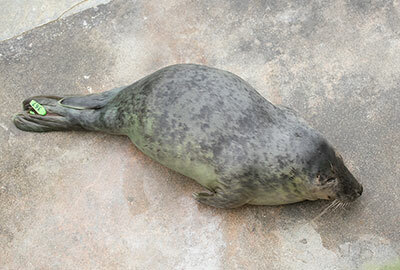 The pup was taken and treated at one of BDMLR´s holding facilities until a hospital pen became available at Gweek on 14th February 2018. Update - 25th February 2018 : Charlie is currently in the nursery pool number 3, he weighs 19.5kgs. Charlie´s flipper tag number is 367 (green). 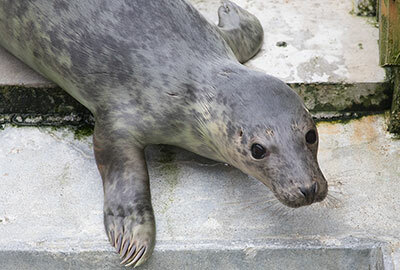 Update - 28th March 2018 : Charlie has been moved up to the hospital isolion pen 2 so the Animal Care team can keep a closer eye on him for a few days until he feels better and will be returned to the outside pools soon. The photo of Charlie was taken on 25th March 2018, click here to see a larger version of this. Update - 29th April 2018 : Charlie is currently in the convalescent pool and putting on lots of weight, He currently weighs 26kgs. 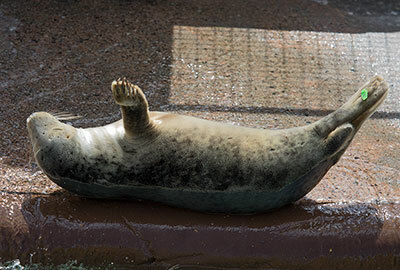 The photo of Charlie was taken on 27th April 2018, click here to see a larger version of this. Update - 1st July 2018 : Charlie was released back to the wild on 21st June 2018.